What is the relationship between scientific research and ethics? Some think that science should be free from ethical and political considerations. Biomedical Research and Beyond argues that ethical guidance is essential for all forms of inquiry, including biomedical and scientific research. 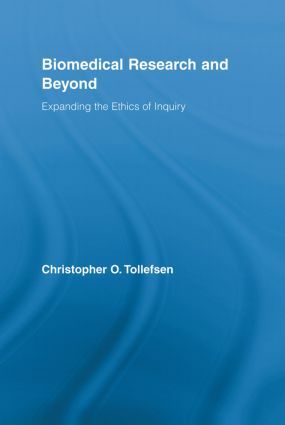 By addressing some of the most controversial questions of biomedical research, such as embryonic research, animal research, and genetic enhancement research, the author argues for a rich moral framework for the ethics of inquiry, based on the ideal of human flourishing. He then looks at other areas of inquiry, such as journalistic ethics, and military investigation, to see how similar they are to the ethics of scientific research. Finally, he looks at the virtues that must play a role in any life that is devoted to research and inquiry as a vocational commitment. Is There an Ethics of Inquiry?